Begging is a cute dog trick that is moderately easy to train a dog to do. If you don't like the idea of "begging," you can think of this as training your dog to "sit pretty," or sit with their hind legs on the ground and their front paws up in the air. With a little patience on your part, your dog will soon be sitting up to beg on command. You'll need to have some uninterrupted time and patience. Make sure your dog is not distracted, has recently eaten, and gone to the bathroom. 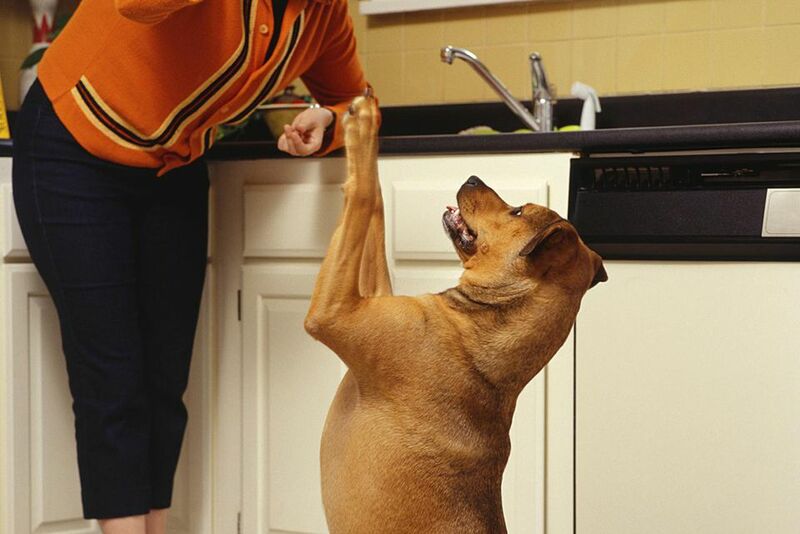 Have a handful of your dog's favorite treats ready when you begin training it to beg. If you are clicker training, have your clicker handy, too. You'll start training a dog to do this dog trick by asking it to sit. If your dog isn't able to sit on command, go back and work on the sit command before teaching it to beg. Once your dog is able to sit on command, proceed with the training. With your dog in a sitting position, hold a treat at its nose, and give your pooch the command "beg." As your dog reaches to take the treat in its mouth, slowly raise the treat over its head so that your dog will have to reach up to get it. Pull it up until the dog is sitting on its hind end with the front paws off the floor and held in front in the begging position. As soon as your dog is in the begging position, tell your dog "good" or click your clicker, and give it a treat. Repeat these steps several times each day for short training sessions. It won't be long until your dog is begging on command. Some dogs won't go into the begging position during the very first training session. In this case, you may need to train a dog to beg in smaller steps. This type of training is referred to as shaping. The clicker can be very useful in shaping behavior. Begin with your dog sitting. Hold a treat in front of your dog's nose, and give the dog the command "beg." Slowly move the treat up so your dog will have to stretch their nose up in the air to reach it. As soon as your dog lifts its nose in the air, click your clicker or tell it "good," and give it a treat. Repeat this step several times until your dog is raising its nose in the air every time you give the beg command. Next, set the bar a little higher. Only click and treat when the nose goes in the air and one of the paws comes slightly off the ground. Repeat this until the dog is doing it consistently every time you give the beg command. Keep choosing behaviors that bring your dog closer to getting into the begging position. Practice each new behavior until your dog is doing it each time you give the beg command. In this way, you'll slowly train your dog to sit up and beg. Once your dog has successfully sat up to beg several times in a row, you should only click and treat when your dog gets into that position on command. Practice the beg command for a few minutes several times each day. If your dog makes a mistake more than two or three times in a row at any stage in the training process, go back to an earlier step. Practice that step until your dog your dog is always doing it correctly, and then begin moving slowly ahead in the training once again. Once your dog has got the beg command down, continue to practice and reinforce it. If you don't keep consistent, your dog might lose its training. If that happens, just start the training all over again.